Trusted team DAVID A. ADLER and EDWARD MILLER continue their series of popular math books with a primer on money! 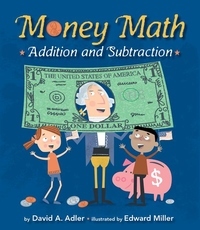 DAVID A. ADLER and EDWARD MILLER continue their series of award-winning math books with Money Math American presidents guide children through concepts and equations in this lively introduction to currency values and adding, subtracting, multiplying, and dividing money. Topics covered include units of money in the American system, from pennies to dollars; the many ways these units combine to make a price; basic money symbols such as the dollar and cents signs; and the fraction math inherent in shopping. After reading Money Math, kids will be confident with their pocket change!